The Custodian of the Two Holy Mosques, Saudi Arabian King Salman bin Abdulazis, will be held responsible for the 700 plus fatal casulaties of another stampede at Mina and hundreds more seriously injured during this year’s hajj. The safety of altogether three million pilgrims cannot be granted even when the faithful are driven like cattle from one holy place to the other. After last week’s crane crash in Mecca’s Holy Mosque with 107 dead people one gets the impression that the destination of millions of pilgrims has been desecrated in recent years just for economic reasons. Is there any place where muslims who have prepared themselves for years, saved almost a fortune to finally get there, can gain spiritualism? Jihad has first and foremost the meaning of spiritual struggle, to strive for serving better the purpose of God. Rather than to finance jihadist groups in Syria and Iraq or relentlessly bombard Houthi rebels in Yemen, the poorest country of the region, Salman is better advised to better serve 1.5 billion muslims who just want to gather in peace, and safe, in Mecca once in a lifetime. And not deny millions of muslim refugees shelter after years-long civil wars in neighboring countries in which the Kingdom is at least partly involved. 24 September 2015 @ 4:37 pm. Last modified September 24, 2015. 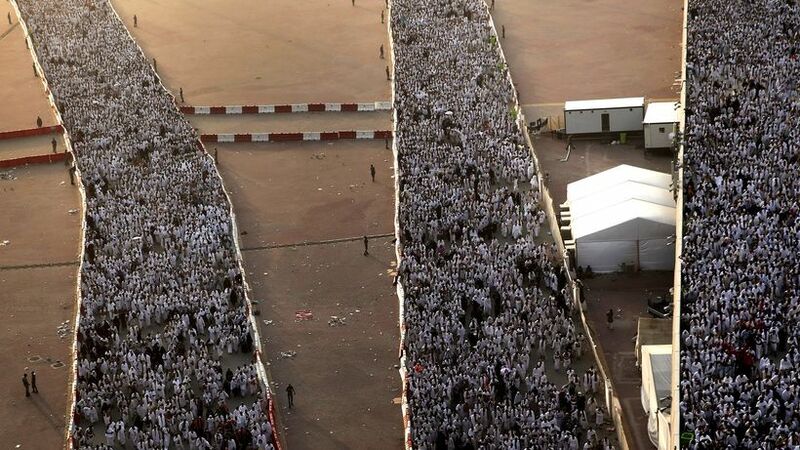 This entry was posted in Saudi Arabia and tagged Hajj, Mecca, Salman bin Abdulazis, stampede. Bookmark the permalink.